After some discussion in the Discord and several IRL discussions following the election of Trump, I found two things. 1) There is an increased interest in Leftist ideas; Anarchism, Socialism, Communism, etc. The Left and the myriad of ideas that encompass "Leftist" thought can be very esoteric and difficult to understand. Speaking personally, I know it is also difficult sometimes to find and hold onto hope for the Left. History is written by the victors - and all too often those victors are a few degrees to the right of center. So my intentions for this particular topic are to explain, explore, and create a dialogue for Leftist things. Schools of thought, historical events, organizations, books, poems, and all that. I'll try to update this weekly (at least) and I, in all honesty, will be using it to keep myself mentally active and engaged in learning more about these things. I do not profess to be an expert in any of this and in true Leftist fashion I'm not so sure anyone is. However, I have a strong background in Left-wing writings and ideologies, I got a bachelors in history (not my main focus) and wrote my psychology Masters thesis on the life and psyche of Stalin. I also have quite a bit of free time lately and, when I get busy again, hope to carve out a weekly block of time to PT and this little project. So, what do I plan to discuss? and idk, other stuff. Let's start there. I'll post my first thing tomorrow. Can't wait to see what you folks have to say about some of this and I hope to give you some well-researched things to think about. Last edited by Jalal Al-e-Ahmad on Thu Nov 09, 2017 7:43 am, edited 1 time in total. First published in 1852 in New York City within the German-language periodical Die Revolution, founded by Joseph Arnold Weydemeyer who would later serve as Lt. Colonel in the Union Army. -Helped establish the Marxist concept of "Historical Materialism"
-Helped establish Marx's idea of the "Capitalist State"
Europe in the early half of the 1800's was not having a very good time. Famine swept through the continent and British industry had fallen in a deep recession after it was discovered that India and the other colonies had all the railroads they could possibly need. The social situation brought about by industrialization was pretty bleak - a young Frederich Engels documented the terrible conditions of textile workers in the Manchester, England in his 1844 work The Condition of the Working Class in England. Europe, which had only just seen an end (or at least decline) in absolute monarchy, feudalism, and unrestrained power now found itself at the whims of economic booms and busts both domestic and foreign. To the common European worker, there was little difference between this and the whims of a Monarch. Many felt powerless, a third of all Parisian's were unemployed, and many sought an immediate solution and someone to shake up the system. At the time, France was a Constitutional Monarchy ruled by Louis Philippe. Like all good Monarchs in a time of strife, he clamped down on the population and limited public protest and public gatherings. To get around this, the wealthy and politically active of France organized banquets wherein they discussed politics and an end to Louis Phillipe. They themselves had put Phillipe into power just two decades earlier, hoping for a liberal Constitutional Democracy yet he proved a tyrant and limited the vote to a mere 1% of the population. He soon shut down the banquets, but after his soldiers killed 52 protesters in Paris and the people flooded the streets and established barricades, he fled and left his throne empty. 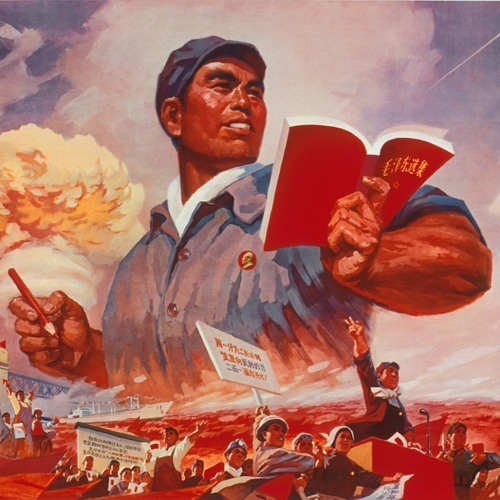 Well-meaning Liberals soon established the Second Republic and set out two main goals - expanding the democratic elements of the government, and providing aid to the thousands of unemployed workers. What happened next may sound pretty familiar. The Liberal Republic 2: Electric Boogaloo did what Liberals do. It expanded the vote, but not too much: adding nine million French men but no women. It repealed a good amount of censorship, resulting in a boom of newspapers and political clubs. It set up a system of government-run private businesses called National Workshops, employing thousands. But not everyone was happy about this. Throughout the spring and summer, the working classes pushed for the Republic to move Left, yet French business owners and farmers resented the increase in taxation needed for the Nat'l Workshops and worried all this free thinking nonsense would not restore order - the working class neighborhoods were still regularly a hotbed of crime, strikes, and barricades. Conservatives and moderates triumphed in the April 1848 elections and cut back a good deal of these programs. In June they announced the closure of the National Workshops and deployed troops to the working class neighborhoods. Three days of fighting followed, known as the June Days. The workers fought and lost. This defeat left what Marx would call "“pure bourgeois Republicans" - modern day Liberals. They set out to draft a new constitution, without all those damn entitlement programs and with more tax dollars going back in your pocket. Louis-Napoleon Bonaparte (Napoleon III) would then be elected President of France through universal male suffrage, winning an impressive 74% of the vote. Louis was the nephew and heir of Napoleon. He was the first Head of State of France to hold the title President, the first elected by a direct popular vote, and the youngest until the election of Emmanuel Macron in 2017. Louis was backed by the Party of Order, and they really hoped this spoiled mustachioed guy would be an easily manipulated fool (spoiler: he wasn't). The Left organized a peaceful demonstration. Louis and his PoO (haha) had them arrested and expelled. Louis would soon turn on the Party itself, dismissing the ministry and appointing loyal and subservient buddies. Executive orders abounded. The Party was pretty bummed. What happened next may sound familiar. The Party did not check Louis' power, they said "he's our guy" and doubled down. When voters overwhelmingly supported the left Social Democrats, the Party of Order moved to abolish universal suffrage. The Party soon faced having to work with the same Social Democrats they had isolated and nobody could agree on a thing. Meanwhile, Louis seized control of the army away from the Assembly, appointed more buddies to key positions, and in 1850 carried out a succesful coup and declared himself Emperor of France. First, why and what is the eighteenth of Brumaire? During the French Revolution the revolutionaries were, like, so revolutionary. Even the Roman calendar was something your Dad would use, so it had to go. They adopted a new way of telling time. 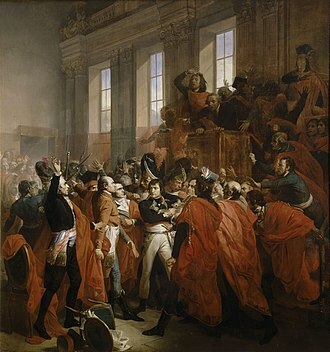 The Eighteenth of Brumaire was November 9th - the day in 1799 when Napoleon Bonaparte became dictator. Napoleon I was a tragedy, the end of a revolution started to overthrow a tyrant ending in a new tyranny. Napoleon III was a farce, the result of Liberal's exercising none of their powers to stop him, hubris, and half-measures to fix a deep class-based wound in French society. Just when [people] seem engaged in revolutionizing themselves and things, in creating something that has never yet existed, precisely in such periods of revolutionary crisis they anxiously conjure up the spirits of the past to their service and borrow from them names, battle cries, and costumes in order to present the new scene of world history in this time-honored disguise and this borrowed language. When in doubt, point to the past. Marx later wrote that the purpose of this text was to "demonstrate how the class struggle in France created circumstances and relationships that made it possible for a grotesque mediocrity to play a hero's part." Circumstances and relationships are a big deal in Marxism, and form the foundation for a concept known as Historical Materialism. Marx had tried and failed to become a professor of philosophy, and held a good deal of bitterness about it. A former friend turned philosophical rival was Ludwig Feuerbach, and Feuerbach insisted people could alter the world around them. He would have loved The Secret, because after all if you just put your mind to it anything's possible, right? Marx was wholly against this. There were laws that one couldn't break and conditions one was born into and to ignore these was to be outright foolish. "Hitherto men have constantly made up for themselves false conceptions about themselves, about what they are and what they ought to be. They have arranged their relationships according to their ideas of God, of normal man, etc. The phantoms of their brains have got out of their hands. They, the creators, have bowed down before their creations. Let us liberate them from the chimeras, the ideas, dogmas, imaginary beings under the yoke of which they are pining away. Let us revolt against the rule of thoughts. Let us teach men, says one, to exchange these imaginations for thoughts which correspond to the essence of man; says the second, to take up a critical attitude to them; says the third, to knock them out of their heads; and -- existing reality will collapse...Once upon a time a valiant fellow had the idea that men were drowned in water only because they were possessed with the idea of gravity. If they were to knock this notion out of their heads, say by stating it to be a superstition, a religious concept, they would be sublimely proof against any danger from water. His whole life long he fought against the illusion of gravity, of whose harmful results all statistics brought him new and manifold evidence. This valiant fellow was the type of the new revolutionary philosophers in Germany." So what the heck does all that mean? Just saying "gravity is a social construct brought about by the Patriarchy" doesn't mean you won't fall. Just saying "I don't believe in drowning" doesn't mean you won't drown. Rules are rules. To bring it back to Louis Napoleon and all the French stuff - you can't just explain the coup/revolution as "The Party of Order wanted this guy to be king." You need to understand the material conditions and the social relationships of the whole situation. Remember that the bourgeoisie just 60 years earlier had played a big role in abolishing Monarchy and instituting a democratic government, and yet here they were crushing worker's revolts and rolling over for a new Monarch. Why? Because the bourgeoise has split into three main factions - the guys who owned the land, the guys who owned the factories, and the guys who lent those two guys money. “each of the two great interests into which the bourgeoisie is split—landed property and capital—sought to restore its own supremacy and the subordination of the other"
They held allegiance to the Party of Order, sure, but not before they held allegiance to their respective money making ventures. The best system for these folks, always at each others throats, was a democratic republic. There they could hash it all out peacefully. But the problem was all these damn special interests wanted to hash out their problems too - the women, the poor, the minorities (aka: the population as a whole). The Liberal democratic republic was both the best and worst possible scenario for a capitalist system - it was a dialectic. "The republic, true enough, makes their political rule complete, but at the same time undermines its social foundation, since they must now confront the subjugated classes and contend against them without mediation, without the concealment afforded by the crown, without being able to divert the national interest by their subordinate struggles among themselves and with the monarchy." In other words - there was no big bad guy to blame anymore for why people are poor. There was no singular evil for the poor tenant and his landlord to rally against. The landlord had the stand there and answer "why do you get so much and I so little when we both need each other" without saying look man, I don't make the rules here. So nervous were the landlords, industrialists and bankers to face this and have to provide an answer that they were willing to sacrifice the whole parliamentary republic to maintain social peace - and their profits. They would even let an arrogant and obviously malevolent brat like Louis take it over before their very eyes, even while they could clearly stop it at any point. They were not the pro-democracy folks they said they were. AND Louis Bonaparte was not a representative of any actual ideology. He wasn't the sigh of an exhausted revolutionary body like Napoleon was. He wasn't a working class hero for the poor plebs like Caesar. He was a separate and alien figure, he just was the dictator for the sake of a dictator, he was State power without anyone saying "these are the interests represented by the State" or "this is why we have a State." It just was. "the feudal dignitaries into paid officials and the conflicting pattern of conflicting medieval plenary powers into the regulated plan of a state authority whose work is divided and centralized as in a factory"
And clearly this social imbalance isn't working itself out in a Liberal democracy. Look what happened with The Party of Order. The poor will never overcome the power dynamic that separates them from the rich. The rich want to stay rich and will gladly let a tyrant with no political ambitions besides "ME IN POWER, YOU LISTEN TO ME" preserve the order that lets them stay rich, and will gladly serve this tyrant and keep it going. But it has been shown that power had become something the haves wield to keep what they have away from the have-nots. If the have-nots could seize and wield similar power - by popular revolution for example, they could level the playing field and establish a classless society of equals.